Even though Labor Day on May 1st is an American invention, the United States mark it four months later by now, on the first Monday in September. Over there, across the pond, Labor Day has lost its aura, meaning it is not really the labor movement’s day of protests anymore, but a holiday many families use for day trips. Things look partially different in Europe, where May 1st still has its original purpose. In many cities, workers and employees do hit the streets, in order to demand a decrease of working hours, higher salaries or better labor conditions. In former Soviet Bloc countries like Bulgaria, May 1st is also the day for those who want their brutal communist regimes back. They wave red flags and dream of a return to times which have been over for almost 30 years. In Germany, the Nazi regime made May 1st an official holiday shortly after coming to power in 1933. After World War II, Labor Day remained the day of protests and demands in the Federal Republic of Germany, while the GDR celebrated it’s “state of workers and peasants”. West Berlin developed its own violent version of May 1st. The radical left started taking things apart in the German capital’s Kreuzberg borough. Squatters, punks and other parts of the left scene organized a street fest which started turning violent. At the same time, certain groups did not think the unions did enough to advance workers’ and employees’ rights and tried turning the official May 1st demonstrations into a violent chaos. In 1987, two and a half years before the Berlin Wall opened, things turned bad. At that time, the radical left opposed a census in Western Germany, because “George Orwell is everywhere”. On May 1st, 1987, police increased tensions by raiding the offices of the umbrella organization for opponents of the census in Kreuzberg. The annual city fest was peaceful at first, until frustrated radicals left the traditional protest and joined the party. In the afternoon of May 1st, 1987, stones were thrown at a police car, while another one was overturned. Some radicals blocked a street using construction trailers. Police reacted by ending the street fest using bats and tear gas. That move lead to an additional escalation. At Oranienstraße in West Berlin, members of left-wing groups set up barricades of burning cars. Fire fighters who came to extinguish the fires were attacked. One of their vehicles was set on fire as well. A supermarket was looted and a city train station badly damaged, when it was set on fire too. Once most participants of the rampage were either drunk or tired or both, Police forces ended that night of brutality. As a result of what happened on May 1st, 1987, a special police force was founded by the conservative law and order people who were ruling Berlin back then. Its purpose was to become active in comparable situations. Only two years later, the unit was disbanded, after its brutal approach had been criticized harshly. Two years later, in 1989, the new center-left Berlin Senate wanted to show the conservatives how good they were at dealing with the May 1st situation, by choosing a deescalation approach. But it did not work. 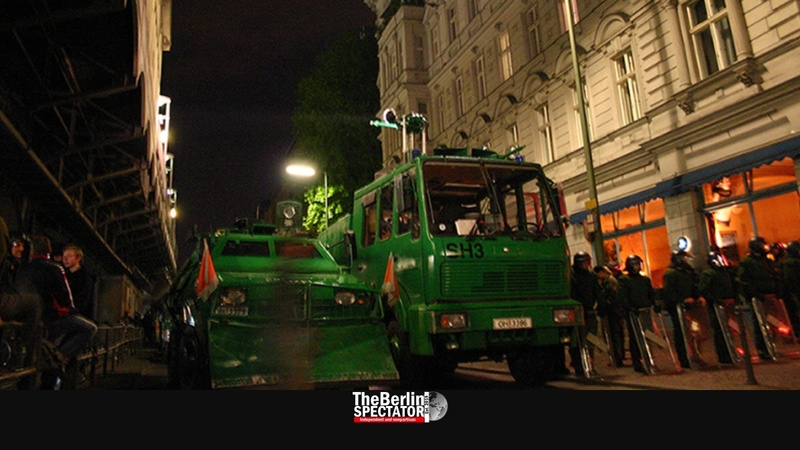 Police needed to use force again, in order to end riots in Kreuzberg. After the reunification, police had to deal with Marxist-Leninist groups and other radical left-wingers who did cause some trouble during the night leading up to May 1st several times, but things looked a lot better than in 1987. Since the new millennium commenced, only some outbursts of violence needed to be dealt with. Those riots were relatively harmless, in comparison, except in 2001, when the traditional May 1st protest was actually forbidden. This year, in 2019, members of the left and the radical left intend to stage protests in Berlin’s Friedrichshain borough, instead of in Kreuzberg. Because of a recent incident, police believe the “threat potential” might be higher this time around. Last weekend, some participants of a large protest against the housing crisis in Berlin seized an empty shop. Police reacted, while some 700 protesters came to protect the squatters. When more police officers arrived to end the situation, they were attacked. During the riot, nine police officers were injured and fourteen arrests were made. During the incident, a protester reportedly approached an officer with a knife, while other participants shouted “Stab him!”. The officer was in a state of shock and needed to be treated. Because of what happened last Saturday, police spokesman Thilo Cablitz told the ‘Morgenpost‘ daily there was “a new quality of aggression”. May 1st is approaching again. While the Berlin police department intends to be prepared for all eventualities, parts of Berlin’s far left are getting ready to fight. “Let’s lever out the system”, it says on social media pages which belong to certain organizations. On the other hand, some appeals do sound harmless. The ‘Vegan Bloc’ is asking people to take part in the big May 1st protests, because “veganism is part of the social justice movements. As such we will participate and hopefully be recognized.” The latter seems unlikely.